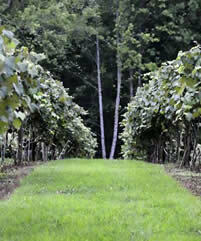 At DelMonaco Winery we make a variety of wines and grow our own grapes on site. We produce whites, reds and dessert style wines that will please a range of palates. We offer any 3 for free, full tasting for $5, a tour, tasting, & souvenir wine glass for $10, & a flight of 4 for $10! Our beautiful Tuscan style building has a two story ball room with wrap-around balcony overlooking the vineyards. Our rooms are available for rent for weddings, private parties, business meetings, or any occasion. Back patio and picnic area in the vineyard available for guests to enjoy wine and cheese outdoors. Chardonnay- Dry : Dry, fresh citrus & lime aromas carry over to ripe apricot and fig flavors on the palate, complimented by a soft and integrated, vanilla wood finish. Espiritu De Oro- Dry : This delicate dry white exhibits fresh citrus & tropical fruit aromas, carrying over to fruity green flavors on the palate, complimented by a refreshing acidity. Merlot- Dry : Ripe plum flavors with notes of cranberry, raspberry, and warm spices balanced by a soft finish. Whistle Stop Red- Off Dry : A Tennessee estate blend of 5 grape varietals, exhibits floral & rich fruit characters on the nose and cherry tones on the palate. Concord Falls- Off Dry : Sweet strawberry nuances on the nose, complimented by a light, dry finish. Southern Rose- Semi Sweet : Made from 100% Tennessee grown grapes. This easy to drink blush has hints of strawberry, tropical fruit, & citrus on the nose & palate. Gewurztraminer- Semi Sweet : Spicy, aromatic, floral aromas carry over to light pear and kiwi fruit flavors on the palate, ending with a crisp finish. Riesling- Sweet : This wine exhibits refreshing peach and ripe red apple flavors on the palate complimented by a refreshing acidity and ending in a sweet, delicate finish. Sweet Whisper Peach- Sweet : This fruit has succulent peach flavors, cascading over your taste buds, complimented by a fresh acidity, giving it a delicate but intense finish. Muscadine- Sweet : Grown since the 16th century and a native American grape of the Southeast. Prohibition did not stop this from being a favorite of many. This wine has a subtle Muscadine character with a splash of tropical fruit. Dulce Nectar Morado (Sweet Purple Nectar)- : This crimson red wine opens with earthy berry notes on the nose, carrying over the strawberry & raspberry flavors on the palate and ends with a smooth, round, lingering finish. Blackberry- Sweet : This wine exhibits rich, warm blackberry flavors on the palate, fulled bodied & creamy. Jammin Blackberry- Port Style : Enjoy this port-style blackberry with chocolate & fruit, or after a relaxing dinner. Made with 100% blackberry fruit, it's sure to be an essential for any occasion.